Throughout the year. Suitable in winter only for those with the required fitness and skills. Experienced mountain walkers, scramblers and climbers. Routes to suit all levels of ability. Advanced skills required in winter. At 1:50,000 the OS Landranger series is sufficiently detailed in almost every case, and the relevant sheet is indicated for each route. One notable exception is the Skye Cuillin, where the terrain is so complex and the contours so close-packed that the 1:25,000 scale Explorer map (sheet number 411) proves marginally easier to follow. The Harvey’s Superwalker 1:25,000 (and 1:12,500 enlargement) of the Cuillin is perhaps the clearest of all. 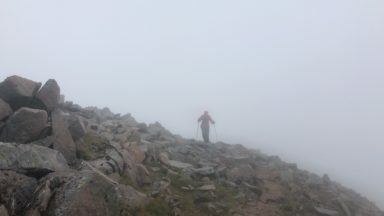 There are two customary approaches to the north side of Ben Nevis, both much of a muchness. One takes the Tourist Track from Glen Nevis, escaping just below the mind-numbing zigzags and contouring around the NW shoulder of Carn Dearg to join the Allt a’Mhuilinn by the CIC Hut. The alternative tends to be more popular with climbers: From the North Face car park near Torlundy head SE through trees, soon turning right. One kilometre later a left turn takes steep muddy slopes into the upper valley of the Allt a’Mhuilinn, and thence over sticky bogs to the CIC Hut. This path has recently been given a partial upgrade, firming up some of the worst boggy bits. 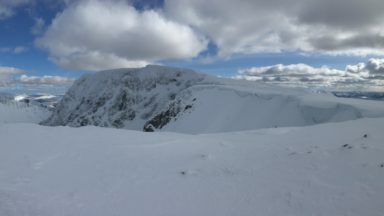 There are two customary approaches to the north side of Ben Nevis, both much of a muchness. One takes the Tourist Track from Glen Nevis, escaping just below the mind-numbing zigzags and contouring around the NW shoulder of Carn Dearg to join the Allt a’Mhuilinn by the CIC Hut. A nice new path connects the Tourist Track with the north tip of Lochan Meall an t-Suidhe, where it simply terminates; a decision on continuing to the Allt a’Mhuilinn is currently pending (summer 2007). The alternative approach up the Allt a’Mhuilinn from the North Face car park near Torlundy tends to be more popular with climbers. The old route ascended a series of muddy slopes that wouldn’t have looked out of place in the Somme. These are currently being bypassed by a new path which climbs through plantations to connect with the forestry track used as a car park by local guides; beyond the gate at the end of this track the route then continues on its old course up the Allt a’Mhuilinn. This latter path has also enjoyed a partial upgrade, firming up some of the worst boggy bits. Throughout the approach, Suilven dominates the landscape. Take the surfaced track beside beautiful Loch Druim Suardalain, and through the grounds of Glencanisp Lodge. At the time of writing the estate has just been bought by the Assynt Foundation, an alliance of local people making good use of Scotland’s community buy-out legislation to secure the area’s future on behalf of all residents rather than a dynasty of lairds, to be run with the twin aims of local economic development and regeneration of the natural landscape. This is a fantastic example for communities elsewhere to follow. Keep heading roughly E through fields and thickets of gorse, where the track becomes a path. For several kilometres this undulates gently, following the N bank of the wide boggy valley of the Abhainn na Clach Airigh. Throughout the approach Suilven dominates the landscape. Take the surfaced track beside beautiful Loch Druim Suardalain, and through the grounds of Glencanisp Lodge. The estate was purchased in recent years by the Assynt Foundation, an alliance of local people hoping to secure the area’s future on behalf of all residents rather than a dynasty of landowners, with a view to regenerating both the local economy and the natural landscape. 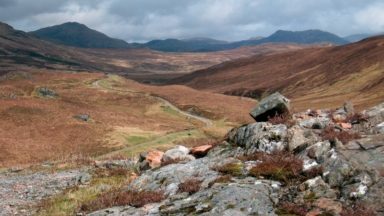 This was widely hailed as a flagship example of community buy-out, supported by many in the hillwalking fraternity and funded in part by landscape preservation bodies. However in the light of such support a recent proposal to build a windfarm on a prominent hillside close to Suilven seems rather ironic. Is this really in line with the Foundation’s core aim ‘to safeguard natural and cultural heritage of the land for future generations and the enjoyment of the wider public’? Keep heading roughly E through fields and thickets of gorse, where the track becomes a path. For several kilometres this undulates gently, following the N bank of the wide boggy valley of the Abhainn na Clach Airigh. Time Your guess is as good as mine. The current record, set by an extraordinarily strong contender, stands at just under 3hrs 30mins between the two terminal summits. At the opposite end of the ability scale, two full days is far from unusual. In friendly weather average parties should reckon on something like 10-16hrs, plus a lengthy moorland tramp to start and finish. Time Your guess is as good as mine. The current record, set by an extraordinarily strong contender, stands at just over 3 hours 17 minutes between the two terminal summits. At the opposite end of the ability scale, two full days is far from unusual. In friendly weather average parties should reckon on something like 10-16hrs, plus a lengthy moorland tramp to start and finish. This menacing shark’s fin forms the true summit of Sgurr Dearg, and is famously the only Munro that requires a rope. In truth many of the other Cuillin Munros are nearly as technical, if less exposed. The pinnacle can readily be avoided, though this would be a shame. Climb the razor-sharp E Ridge in one long roped pitch, which must rank as Britain’s airiest Moderate. Abseil the shorter vertical W side, from a reassuringly substantial hawser under the summit block. This menacing shark’s fin forms the true summit of Sgurr Dearg, and is famously the only Munro that requires a rope. In truth many Cuillin Munros are similarly technical, if less exposed. The pinnacle can readily be avoided, though this would be a shame. Climb the razor-sharp E Ridge in one long roped pitch, which must rank as Britain’s airiest Moderate. Abseil the shorter vertical W side, from a reassuringly substantial hawser under the summit block. A recent rockfall hasn’t adversely affected the abseil, though the adjacent North West Corner (a VDiff route on the W side of the pinnacle) was damaged. One quality that any author would wish for their book is that people would want to pick it up, and that once in the potential reader's grasp, there would be a desire to turn from page one to page two and so on: Dan Bailey's book has this quality. i lost count of the number of people - climbers, walkers, strollers, couch potatoes - that felt the need to pick this book up and leaf through its pages, muttering favourable comments, interspersed with oohs and aahs! Why? Perhaps because, like a number of Cicerone's guides, it is very well presented? It surely is! Or that it is visually stimulating? Certainly its pages are stuffed with evocative and inspirational colour pictures that force the fingers to turn to the next page. Or maybe its that there is something in the subject, in the steeply twisting Scottish ridges that compels our eyes, then our arms and legs, to want more. 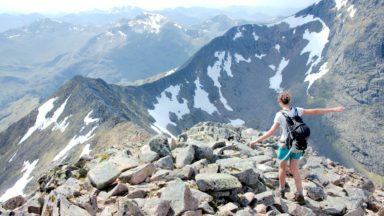 This guide is for mountaineer's rather than walker's, with a distinctly 'uphill' bias! 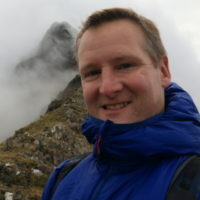 For example, the A'Chir ridge on Arran, though described traditionally first, is given an alternative start up Pagoda ridge, a Severe rock climb. This approach including rock climbs, and some ice climbs, continues throughout the book. It gives a sense of progression from walks to scrambles to climbs, with the best way up to the ridge and along to its summits dictating the route, an approach which this climber thoroughly approves of! In short, this is a fantastic little book, which selects the best of Scotland's ridges, the best ways and days of enjoying them. Whether an enthusiastic young walker looking to move onto steeper ground, or a more experienced climber wanting to re-visit the scene of former triumphs, this book will prove stimulating to both and deserves a place in the bookshelf. It was the late W.H. Murray who once suggested that to earn the freedom of mountains one must be able to climb on both rock and snow. "Those who hold Bach to be the greatest composer do not for that reason refuse to hear Beethoven," he wrote. "Likewise, the hillwalker should not deny himself the pleasure of rock climbing, nor the cragsman of snow climbing." There is much wisdom in Murray's comment but it's a wisdom that tends to buck the current trend of specialisation. Few of today's climbers would admit to being a mere hillwalker and many hillwalkers would never consider harnessing up with a rope to climb a rock face. But perhaps the golden age of peak bagging is in decline, perhaps today's hillgoers are searching for a broader experience of our mountains. If that is the case then Dan Bailey's book on Scotland's Mountain Ridges has appeared at exactly the right time. This isn't really a book about ridge walking in the Mamores or Fannichs sense - this is predominantly a book of climbs and scrambles. All the favourites are here: the Dhubhs on Skye, Curved Ridge on the Buachaille, Ledge Route on the Ben, the A'Chir ridge on Arran, the traverse of Suilven, all mixed in with some fairly serious climbs: the Cioch Nose of A'Chaorachain, January Jigsaw on the great Rannoch Wall of the Buachaille Etive Mor, Tower Ridge on Ben Nevis, the Great Ridge Direct of Ardgour's Garbh Bheinn and Mitre Ridge of Beinn a' Bhuird. 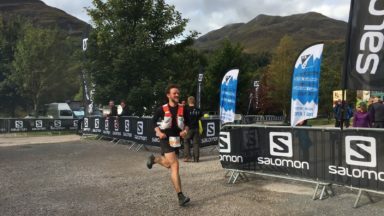 These latter routes could never be described as scrambles, neither could some of the winter ridges that Dan recommends, like the Aonach Eagach or the Mullach an Rathain pinnacles of Liathach. In that sense this book smashes through the demarcation line that has long-existed between walking guides and climbing guides to offer a bit of both - users should take care they are not biting off more that they can cope with when choosing a route. Lavishly illustrated, each route description is accompanied by maps and topos and a lot of good advice on accommodation and travel. For those who are willing to take their eyes off the summits occasionally this book offers a feast of mountain delights and is a suitable testimony to the wealth o ridge wandering and climbing to be found on Scotland's hills. 'For newcomers to Scotland, this book will reveal a whole new world waiting to be explored. For old hands, it will serve to remind them of just how much the Highlands have to offer. 'When this new book from Cicerone landed on my desk my heart leapt. Its large format pages are filled with colour photographs and OS maps. It can not fail to inspire anyone with a mountain spirit. 'I have always thought that if mountains were not meant to be climbed they wouldn't have grown ridges, what can be more natural than wanting to scale them? 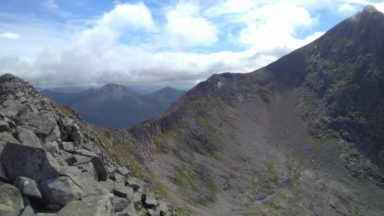 Included, as you would expect, are classic traverses of Aonach Eagagh, An Teallach, Liathach, the Black Cullin Ridge, along with lesser-know gems - Marathon Ridge on Ben Lair and Northeast Ridge of Sgurr Ghiubhsachain. Dan Bailey is a man who knows and loves his hills. To those who claim his book will merely encourage yet more feet on to our fragile mountains, he has this to say "If more people were inspired to visit the Highlands then perhaps their protection might move farther up the nation's agenda." ‘I received this book with a certain amount of scepticism; oh no, not another ‘Best of’ volume, are there not enough out there already? However, I was quickly and pleasantly surprised by the quality of the content, design and layout. I found the book extremely clear and easy to use. It has good maps, very clear diagrams and topos. To complete the information on each route, there are great photos alongside page after page of many favourite days out.